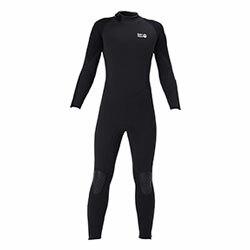 No-frills wetsuit with combination of skin and nylon material. Wrist and ankle zippers provide ease when putting the wetsuit on or taking it off. The mesh skin panel on the front of the wetsuit reduces evaporative cooling when worn on the surface or on land. This is useful on boats or when waiting to catch a wave while surfing.